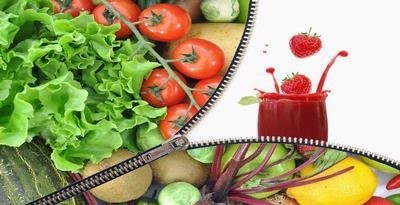 How to Detox Without Starving - The habit of consuming a variety of foods "bad" but sadly needs to be balanced with cleansing detoxification - several times a year. Water will cleanse the body system to keep the kidney, liver, intestine, and spleen work well. Drink two liters of water every day plus one or two cups of tea. There are ways to find out if we consume enough fluids, ie, if we could urinate every few hours and the color of urine is not concentrated. If you normally consume about 1,800 calories, this time a little less to around 1400-1600 calories. Although reduced but the body stay energized. If you reduce it to 1,200 calories the body will begin to burn muscle instead of fat. In addition we are also at risk of vitamin deficiency. Many people feel do not have time for breakfast. In fact, skipping breakfast can make you hungry all day. Choose a healthy breakfast menu such as oatmeal, whole wheat toast, or scrambled eggs. For lunch and dinner, the consumption of vegetable smoothies. Blender some types of vegetables plus fruit at once to get a little taste of sweet and protein (egg whites, tofu, or plain yogurt). This combination will give you vitamins, minerals, fitokemikal, and antioxidants needed. One serving of this smoothie contains about 300 calories, so you need to drink 2-3 times a day. Of course sometimes a glass of smoothie is not enough to give energy if you're pressed tengat work. Add lean protein sources into your dishes, such as fish, skinless chicken, or beans. During the detox program, avoid foods that contain sugar are filtered, and rice flour, high-fat meats, dairy (except non-fat), as well as all kinds of soda and alcohol. Maybe you feel underpowered to perform high-intensity exercise, but low-intensity exercise should still be done to keep the blood circulation so that the toxin spending more smoothly. Although the trend is currently gluten-free diet, but Dr.Gerbstadt said that whole grains actually help us remove toxins from the body by removing cholesterol.